BEFORE: the soil sausage in the lab, before getting buried. Apatite crystals are in there somewhere! AFTER: The soil sausages coming out of the ground, looking just the same! I’m very curious to see what the apatite looks like inside! So what are these soil sausages, and why was I burying them last season and unburying them on Tuesday? Well, to answer these questions, I have to tell you about phosphorus. As you may remember from an earlier blog, phosphorus is one of the limiting nutrients in Dry Valley ecosystems, which means that there isn’t much of it available to organisms. All phosphorus that is available originally comes from the mineral apatite, found in small quantities in igneous rocks. So if we understand something about how apatite breaks down and releases phosphorus, we’ll know something more about how an important nutrient enters the system. Kenyte, a rare rock found in the Fryxell Basin of Taylor Valley, contains a lot of apatite. Is it responsible for contributing a lot of phosphorus to the ecosystem? To study the weathering (or breaking down) of this important mineral, we put store-bought crystals of apatite into the soil sausages. The tubing holding the sausage together is permeable, so water and bacteria can still interact with the mineral surfaces. We buried the sausages in a wet area just outside a stream channel, where we know there is a lot of flowing water. Water is crucial for chemical and biological weathering – we wouldn’t expect much to happen in the dry soils that carpet the majority of the valley. Water was plentiful where we buried the soil sausages. This picture was taken right after the sausage was taken out of the ground. So what are we looking for? After I get back to Dartmouth, I will separate out the apatite crystals, and I’ll look at them under very strong microscopes. 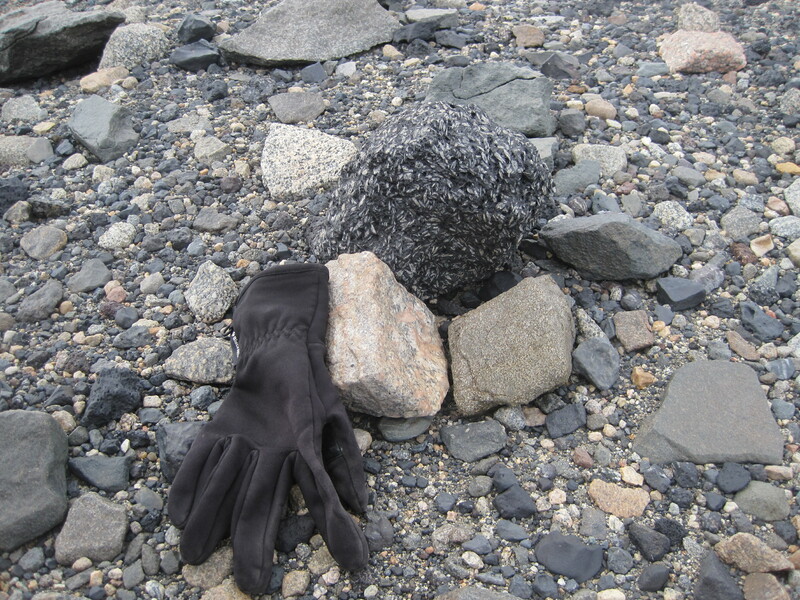 I’ll look for any signs of weathering – small grooves in the surface of the rock. I’ll also look for any signs of life – with these microscopes I may even be able to see bacteria clinging to the surface of the mineral! These signs will tell me how actively apatite is being weathered, and how quickly phosphorus can be released into the system. Back at Dartmouth, I’ll also be looking at apatite grains from the soils themselves (i.e. not ones we put there). So far, I’ve been able to see some interesting patterns in the shapes of the grains. 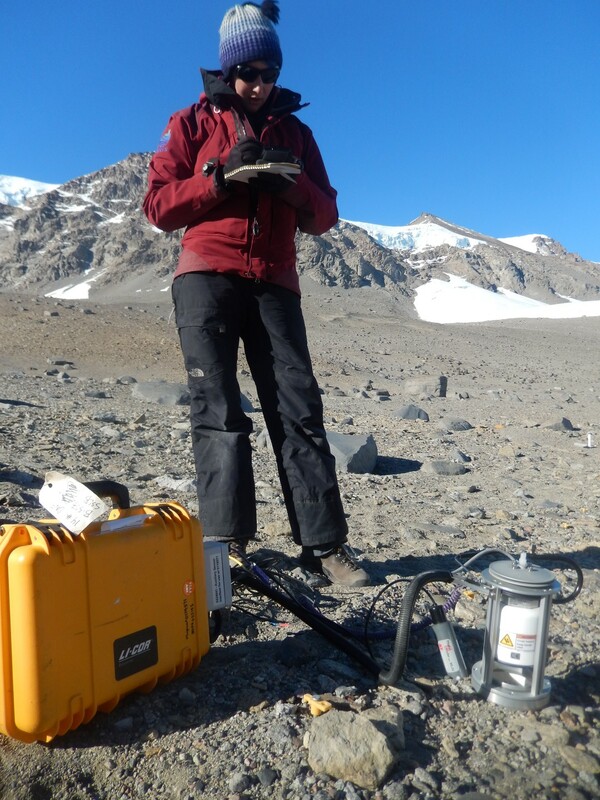 I’m looking forward to understanding more about phosphorus cycling in the Dry Valleys – this will be a project that I’ll be working on for a number of years, and it’s exciting to see it progress! Very happy to collect the sausages! After all, I’ve been waiting for a year! 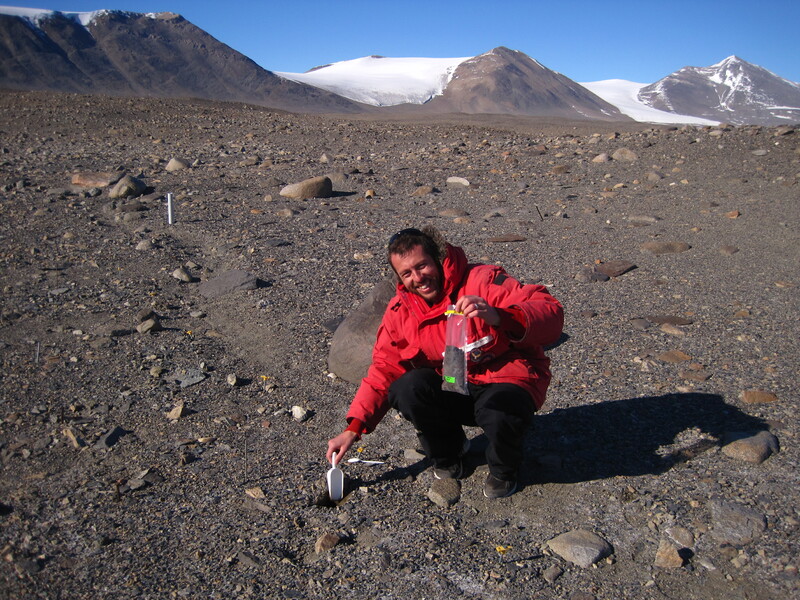 I’ve chosen to study phosphorus cycling in the Dry Valleys. 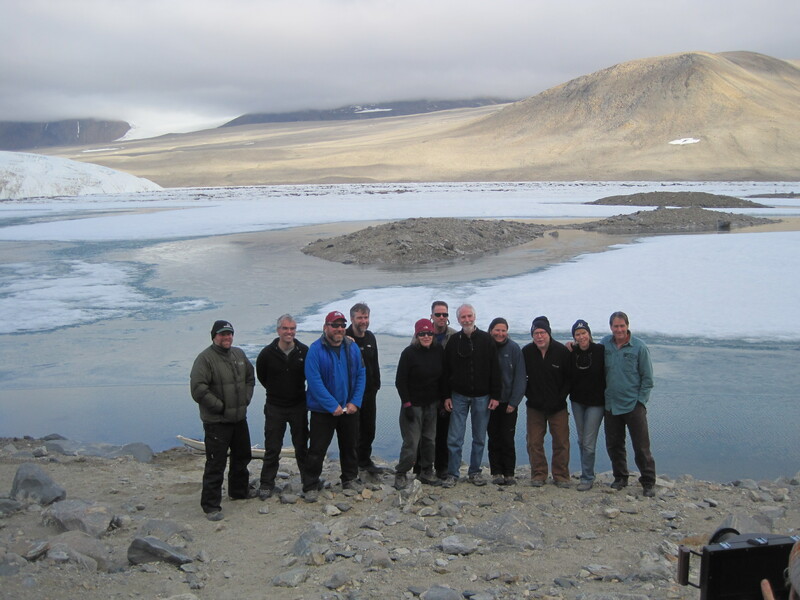 After reading about the Dry Valleys and hearing about our research, what would you choose to study here? What would you be curious to learn about? In many of the blogs I’ve written thus far, I keep on coming back to the delicate balance between liquid water and solid ice. 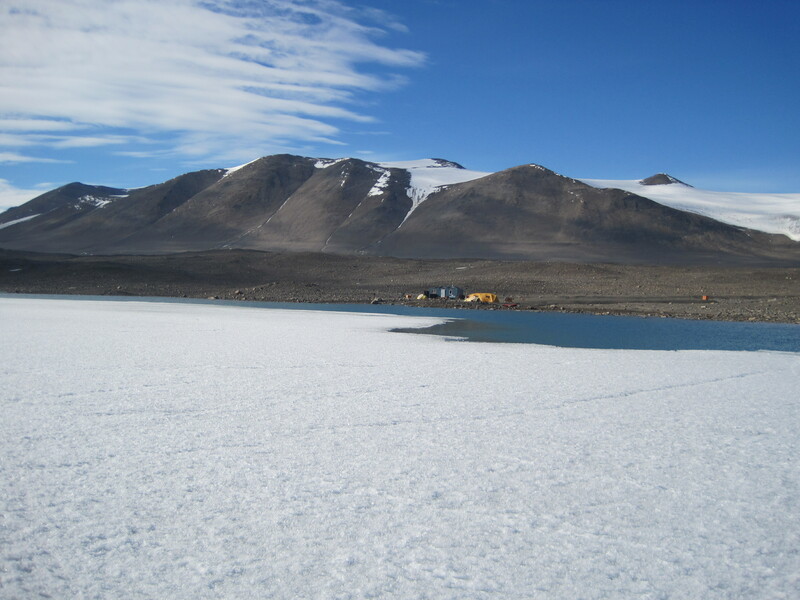 In this environment, where all precipitation falls as snow, and the vast majority of water is in solid form, a small change in temperature can have major consequences. For a small change of temperature in the tropics, liquid water remains liquid water. But here in the polar regions, a small change in temperature results in one of the most incredible transformations: from solid, inaccessible and unmoving ice, to life-sustaining, flowing water. 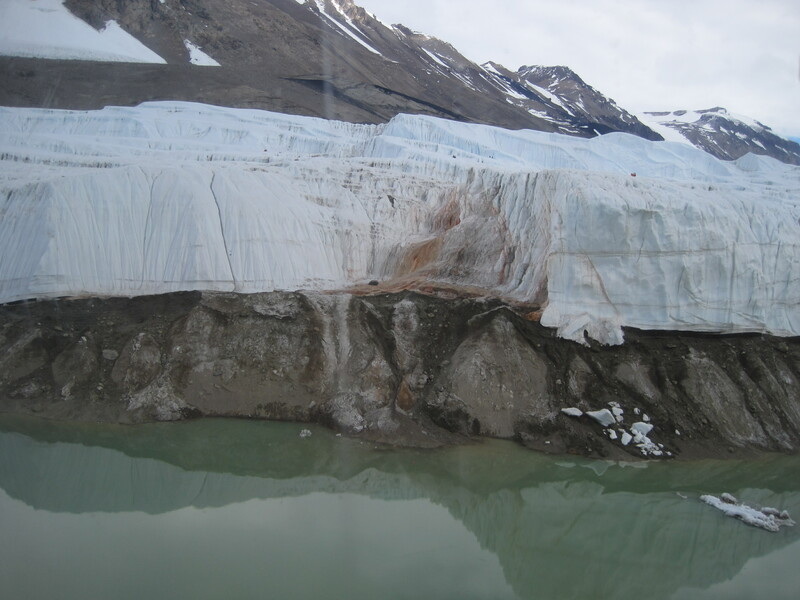 As I’ve mentioned previously, an increase in liquid water may have large consequences for the Dry Valleys. These past few days, though, I’ve been thinking about this phase transformation a little more broadly. Yesterday, we went on a walk around Observation Hill, and it struck me how much of a change I’ve seen in the short three weeks I’ve been here. When I arrived, the sea ice around Ross Island was completely solid. It was hard to remember we were on an island at all. 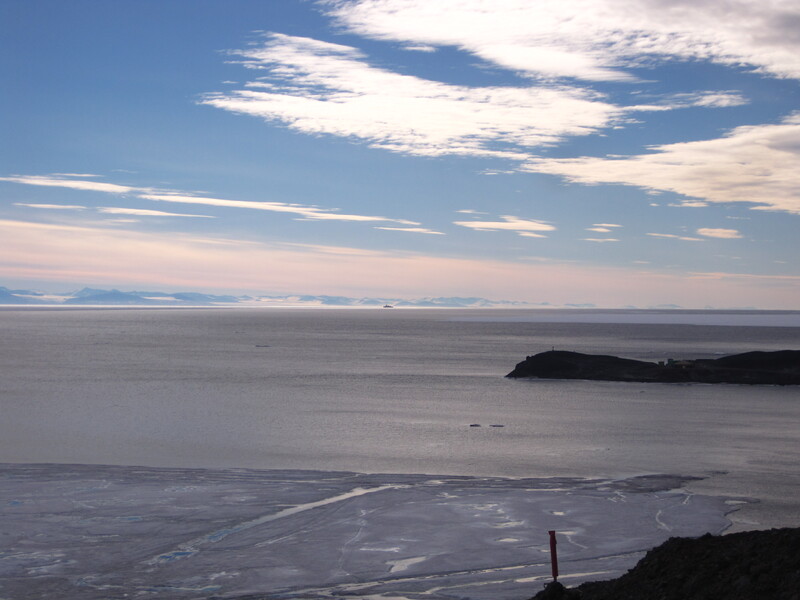 Now, there’s open water extending far off from McMurdo. Part of this is a natural progression of the summer season, and part is due to the Polar Star, the US Icebreaker that has arrived in McMurdo. 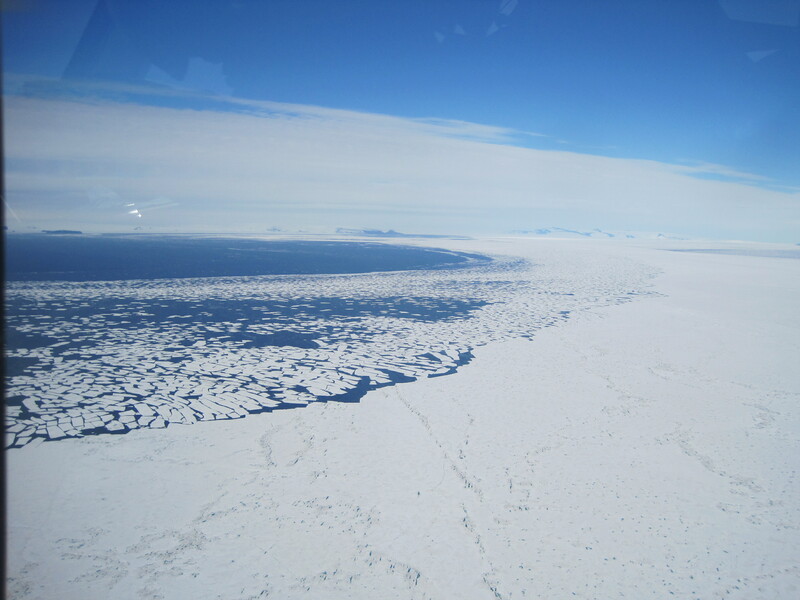 The sea ice near Ross Island is all broken up. This isn’t just a visual change – there are other consequences as well. 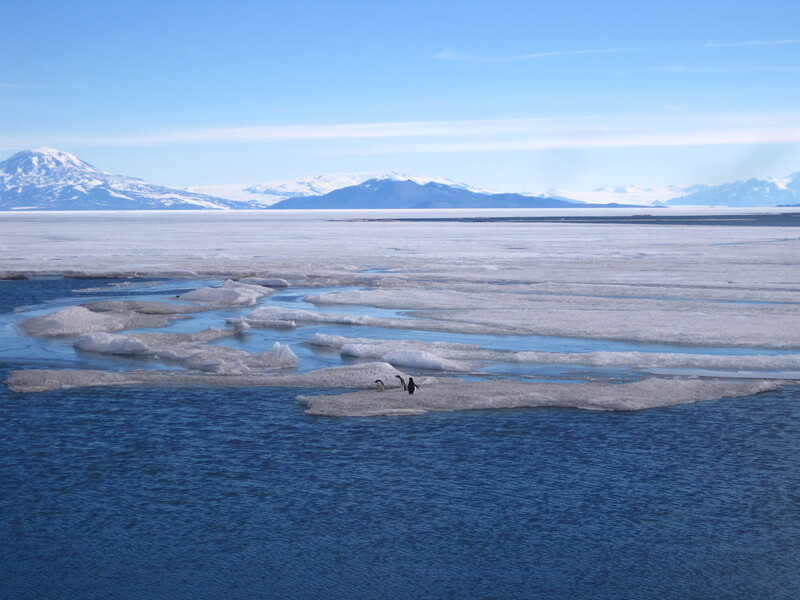 Liquid water brings life – and we’ve been seeing many adelie penguins and some minke whales from the helicopter and right out our lab window! Liquid water brings life: Adelie penguins grace us with their presence right in town! Our helicopter flights are longer now, since we have to remain over solid ground at all times (not a problem, when our flights are so spectacular!). And for the first time, I really get the sense that I’m on an island, that the Southern Ocean is right there. With a ship and open water, it finally feels like we’re living on an island! Today, I had a small-scale experience with the delicate water-ice balance. This morning, we headed out for a full day of fieldwork at Lake Bonney, arriving at our site at around 10:00am. 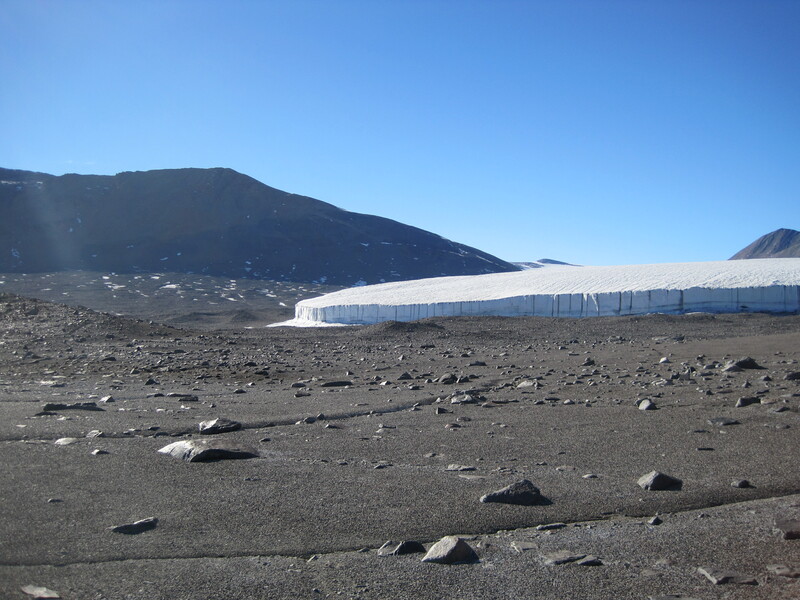 You might think that with 24 hours of sunlight, there are no daily cycles here in Antarctica. But in fact, the daily cycle is strong enough to tip that balance between water and ice back and forth. This morning, the small stream near our experimental plots was frozen over, with liquid water flowing underneath. This morning, Wormherder Creek was completely frozen over. When we left, just a few hours later, the ice was completely gone. When we left, at around 4pm, the ice was completely gone. Tonight, as I write, the water is turning solid again. While there’s nothing terribly significant about this small stream freezing and thawing (although it was incredibly beautiful), it reinforced for me the importance of this most critical phase change. 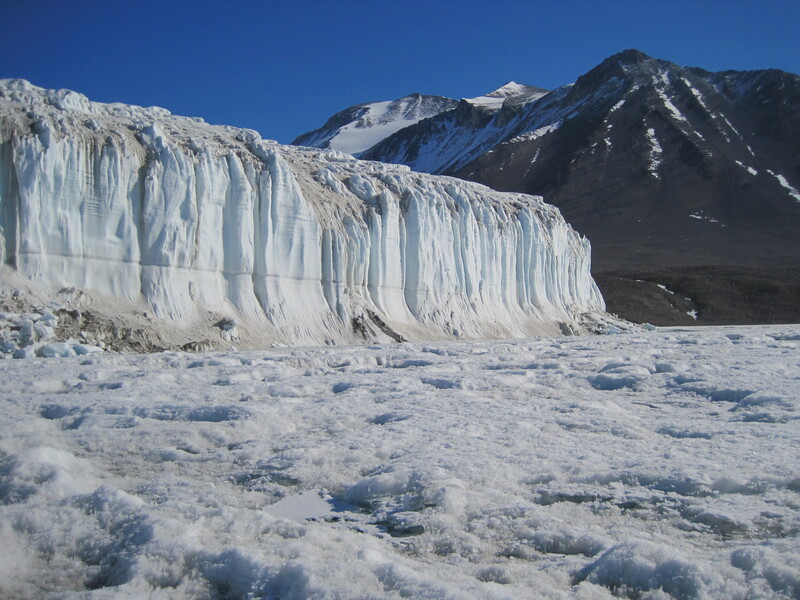 The phase change between liquid water and solid ice isn’t only important in Antarctica. Can you think of ways it impacts the ecosystem where you live, in Vermont? How would our landscape, ecosystem, and culture be different without the transition between water and ice? It’s amazing to me that anything can live in the soils of the Dry Valleys. Even now, during the height of summer, conditions aren’t exactly cushy: soil temperatures on a warm day hover around 50 degrees F, the soils are very salty, and the availability of liquid water is patchy at best. 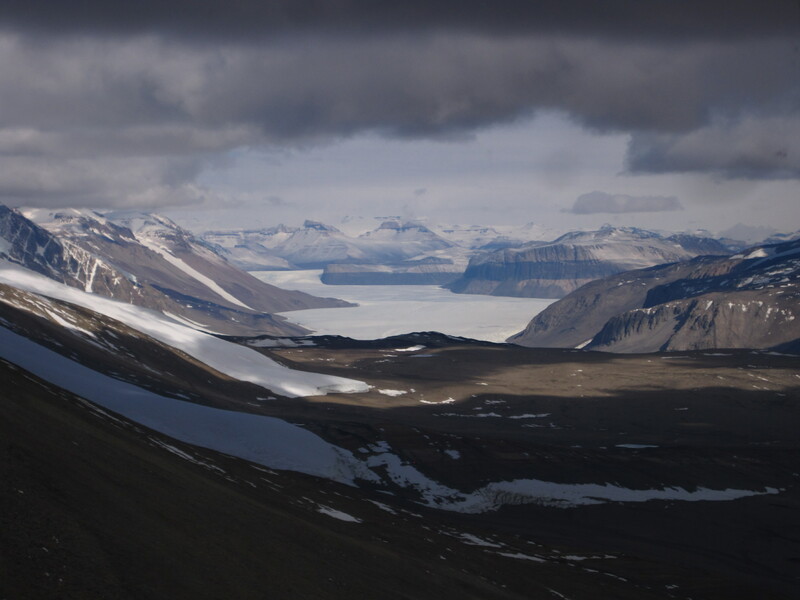 Walking across the rough, rocky surface, it’s no wonder that early explorers and scientists declared the Dry Valleys devoid of life. And I haven’t even mentioned the winter – complete darkness, extreme cold, everything frozen solid. This doesn’t look like an easy place to live to me! So how do they do it? 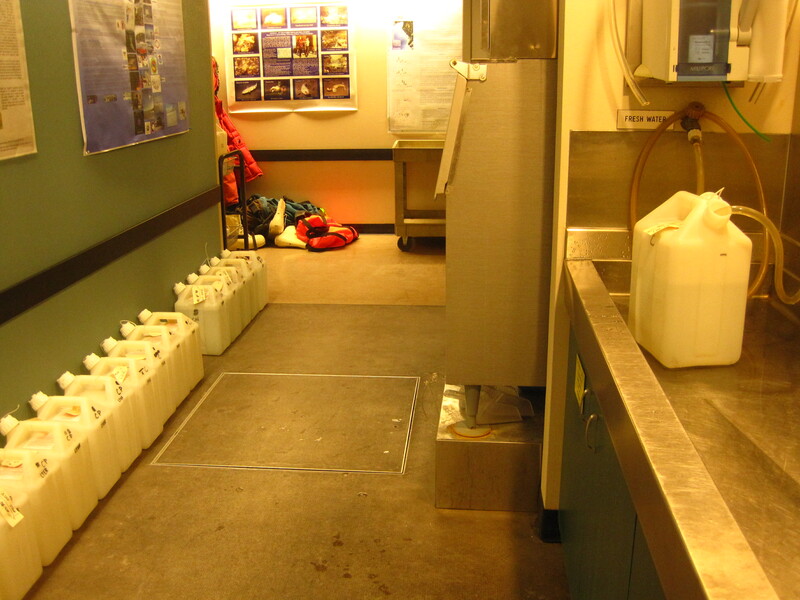 How do we find living creatures in so many of the samples we collect? 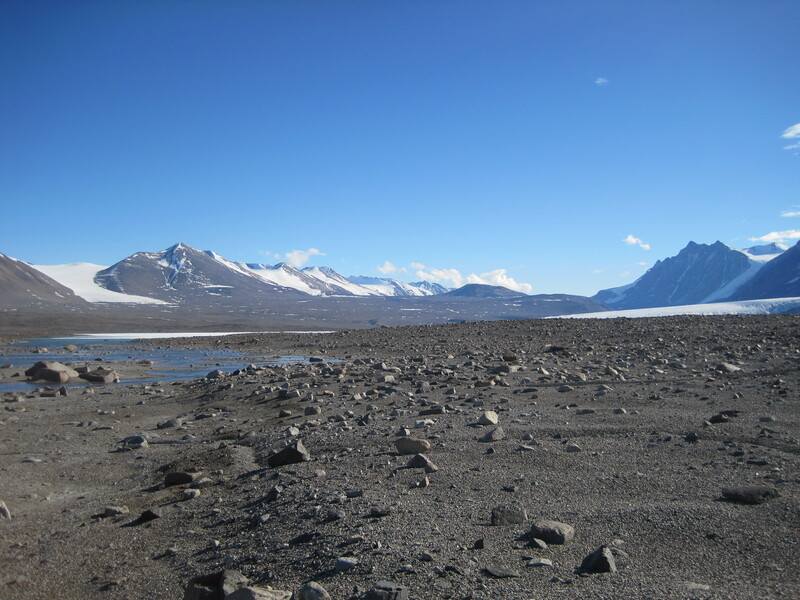 The animals living in these soils must be able to cope with indefinitely long periods without water in the frigid cold, but must also be able to react quickly to the presence of running water. They do so by going into anhydrobiosis, a state in which they are freeze-dried. All bodily functions stop (no eating, breathing, or reproducing) and remain on hold until conditions improve. While organisms in anhydrobiosis certainly appear dead, just add liquid water, and they’ll be squiggling around in no time! 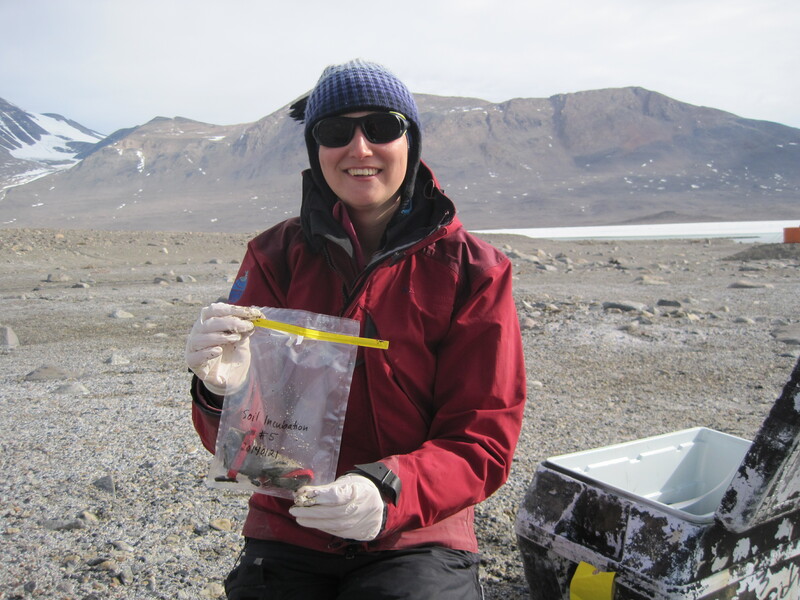 Seals don’t do nearly as well as nematodes in the Dry Valleys. 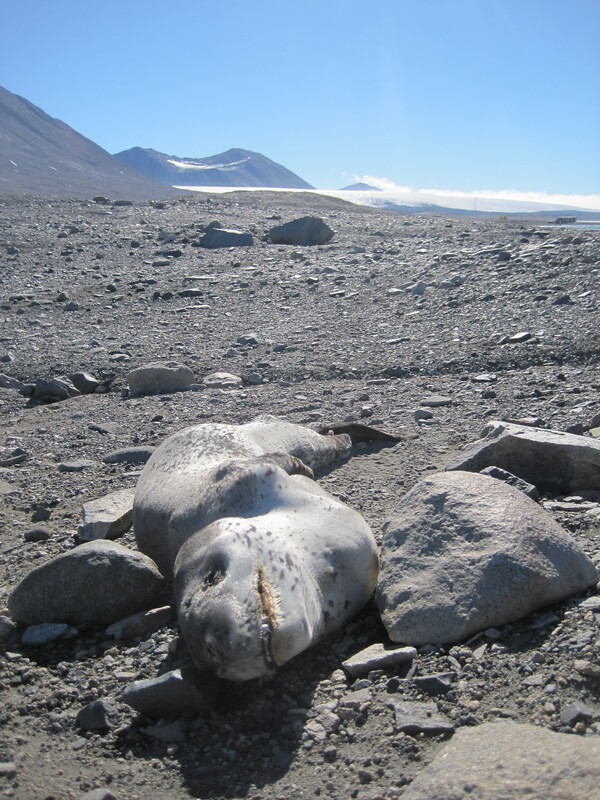 Here’s a leopard seal that somehow made it into Taylor Valley but didn’t last long. If these organisms have no trouble with extreme cold and extreme dry, what can stop them? 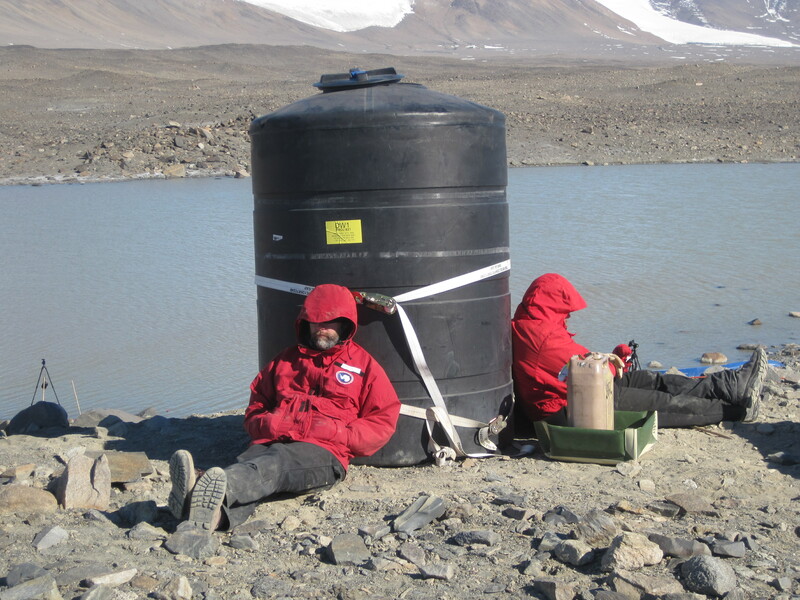 For ecosystems everywhere – not just the harsh environment of the Dry Valleys – scientists like to know what limits life; we like to define the limiting nutrient. Imagine you’re baking a huge batch of chocolate chip cookies – as many cookies as possible. As you keep mixing batches of cookie dough, one ingredient is bound to run out first. Maybe it’s the chocolate chips. You have plenty of flour, sugar, and eggs, but what’s a chocolate chip cookie without the chocolate chips? The same thing happens in an ecosystem, only with nutrients instead of ingredients. There are many nutrients that are necessary for life, and if any of them are in short supply, then life is severely limited. Life even exists under the Taylor Glacier! This is a picture of Blood Falls, where ancient brines seep out from under the glacier, oxidizing and turning red (like rust). Samples from Blood Falls contain living organisms! 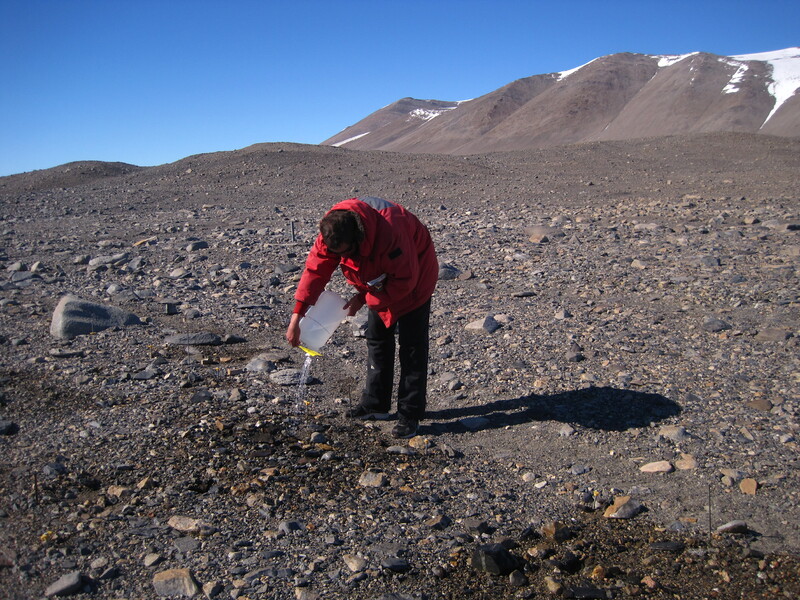 What’s the limiting nutrient in the Dry Valleys? Well, it depends. First of all, there aren’t a lot of any ingredients to start with. In Taylor Valley, the limiting nutrients changes as you head up the valley. Near the ocean, near Lake Fryxell, nitrogen is a limiting nutrient. Up at the top of the valley, near Lake Bonney, phosphorus limits life. In fact, Lake Bonney is one of the most phosphorus-limited ecosystems in the world! As I’ll explain in a future blog post, I’m interested in why the amount of phosphorus varies so much across the valley. Lake Bonney is one of the most phosphorus-limited ecosystems in the world. And it’s not a bad view, either! Knowing the limiting nutrient in an ecosystem allows us to predict what will happen with any changes. How will life respond if more nutrients enter the system (something that may happen due to a warming climate)? We can test our predictions by artificially adding nutrients (like phosphorus and nitrogen), and then seeing what happens. To judge the response, we record things like nematode abundance and soil respiration, a measurement of the activity of organisms in the soil. 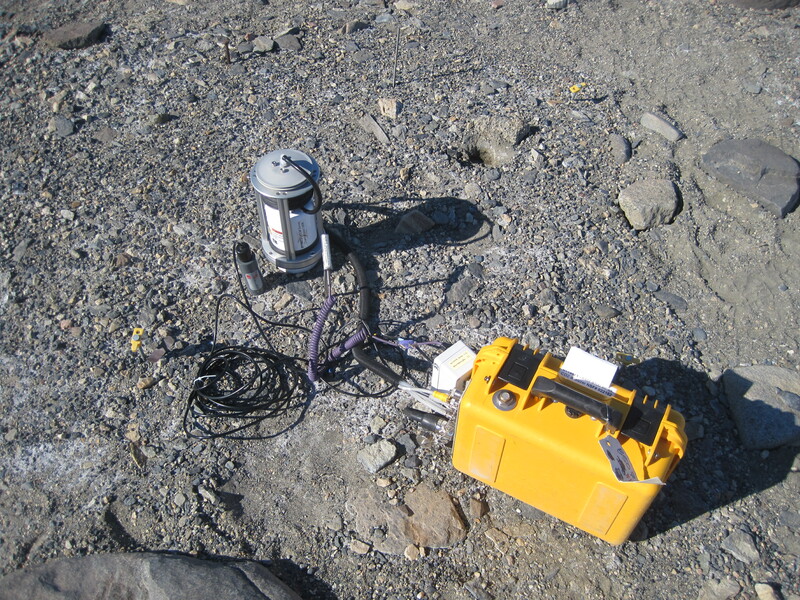 We use an instrument called a Li-Cor to measure soil respiration. We put an air-tight chamber down on the soil and measure how much carbon dioxide builds up over a short period of time. Now you get to make some predictions. What will happen near Lake Fryxell if we add nitrogen? What about phosphorus? And what will happen near Lake Bonney if we add nitrogen? What about phosphorus? Do you think these responses would continue forever with more and more of the added nutrient? 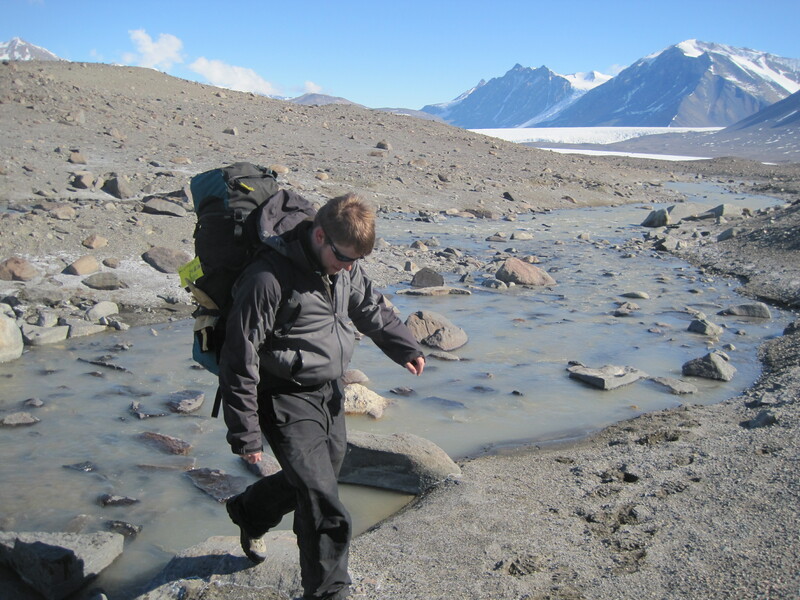 From my blog so far, it probably seems like I spend most of my time in the Dry Valleys among towering mountains and sparkling glaciers. Although taking in the stunning beauty of our field sites is important, this is a warped view of my time in Antarctica. The vast majority of my time is spent in the lab, doing simple, repetitive tasks. It’s quick and easy to collect hundreds of soil samples in the field, but it takes a lot longer to process and analyze those samples. 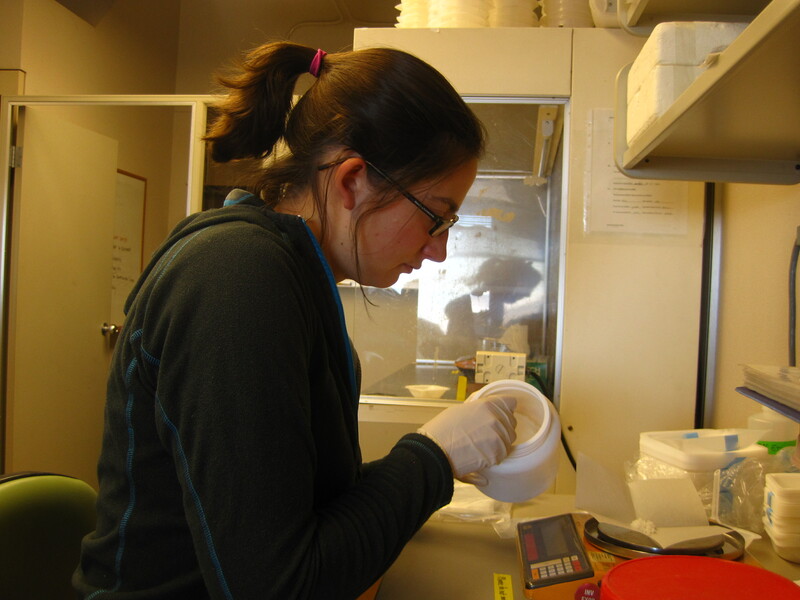 For every single scoop of dirt collected in the Dry Valleys, we have to first label bags and containers, and then measure soil moisture, soil pH and conductivity, count nematodes, and prepare the samples to be sent back to the US for even more analyses! Matt happily collects a soil sample in the field. That one sample will take hours of processing in the lab. I weigh soil. I weigh chemicals. I weigh more soil. I fill plastic containers with water. Although these tasks can seem endless and boring, they never seem pointless. These simple, repetitive tasks are the backbone of the field ecology we do. 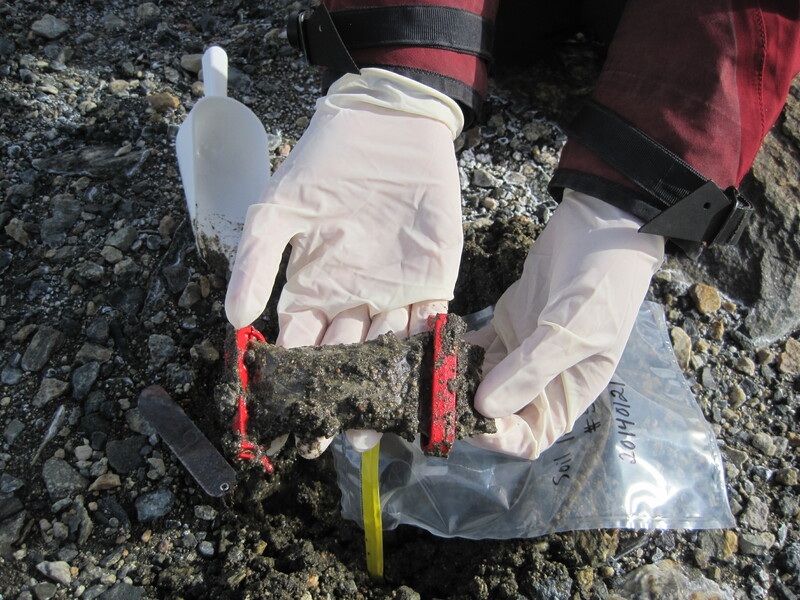 The strength of our research comes from the fact that we collect many, many samples every single year. First, we have to keep track of all those samples (thus the labeling). Then we treat each sample in exactly the same way, using the same quantity of soil (thus the weighing), using clean containers (thus the washing) — even down to stirring the soil in water for the exact same amount of time! 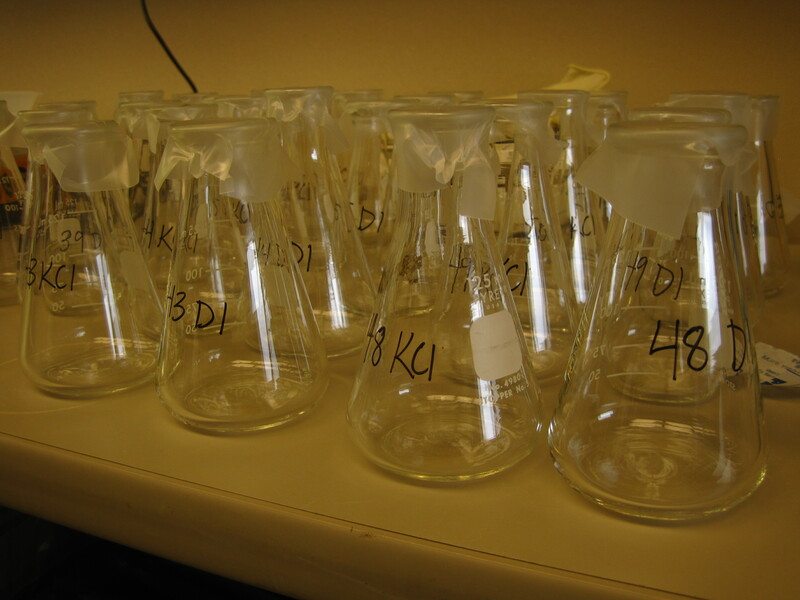 Our experiments in the field are replicated, which means that we do the same thing over and over again to see if we always find the same result. When we want to know the impact of adding water to soils, we don’t just add water to one small area. We add it to many different small areas to see if they respond in the same way (thus the filling plastic containers with water). Matt waters one of the many experimental plots. Completing all of these repetitive tasks gives me time to think. And it’s got me thinking about how many skills we learn through repetition. How do you learn a musical instrument? Repetition. How do you learn a foreign language? Repetition. A team sport? The same. So many activities and skills require doing the same thing over and over again. Science is just the same. Is there anything we learn that doesn’t require repetition? And, more personally, what do you enjoy about repetitive tasks? Do they ever drive you crazy? While washing dishes can sometimes drive me crazy, I know that these small tasks are a crucial part of our whole operation. 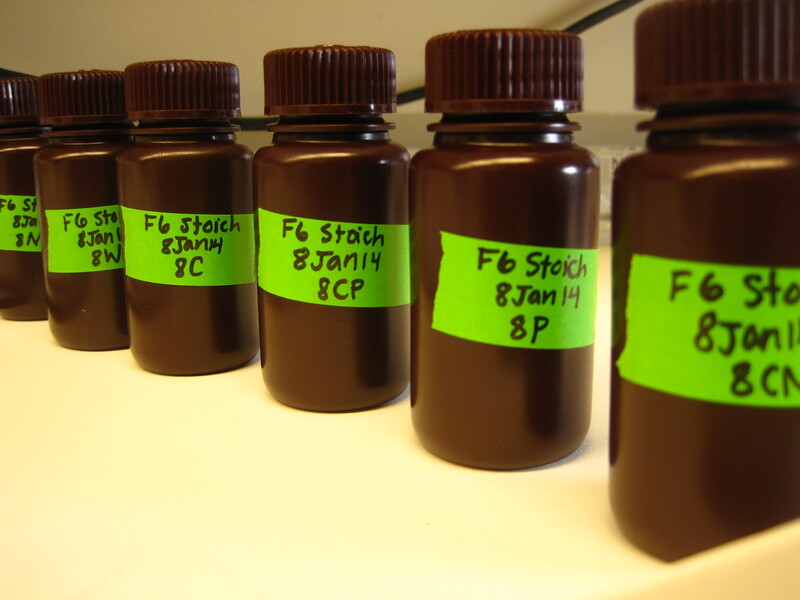 While labeling bags and bottles might seem trivial, our samples mean nothing unless they are identified. 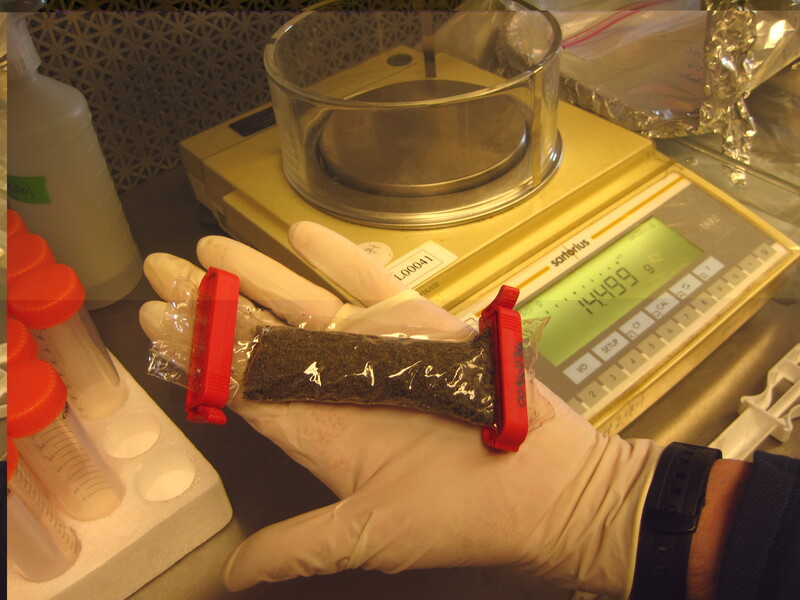 Our samples mean nothing unless we take each step of the process seriously, from scooping soil into bags to running the most technical analyses. 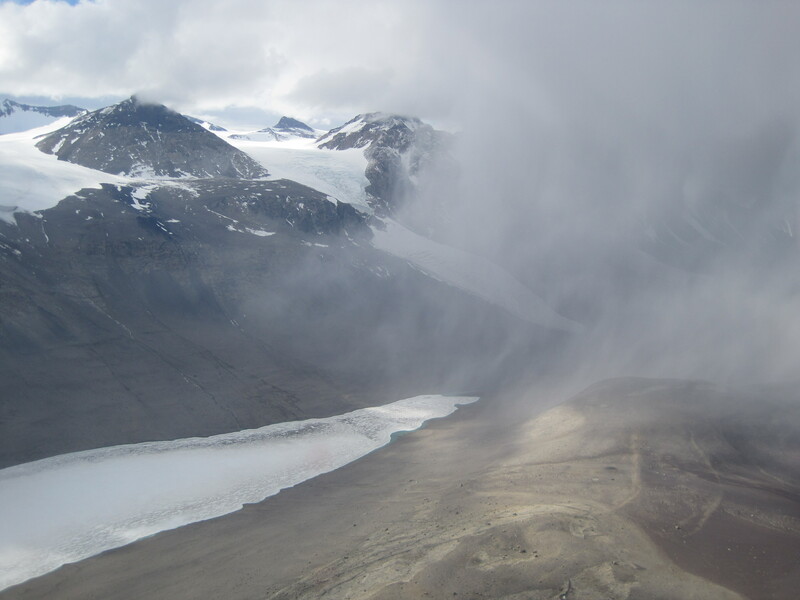 Now that you’ve had a chance to make your own predictions about how the Dry Valleys will respond to a warmer world, I want to take you through one of the predictions our lead scientists have made. I’ll also describe a big experiment that we just started to simulate the impacts of the warming climate on the Dry Valley ecosystem. 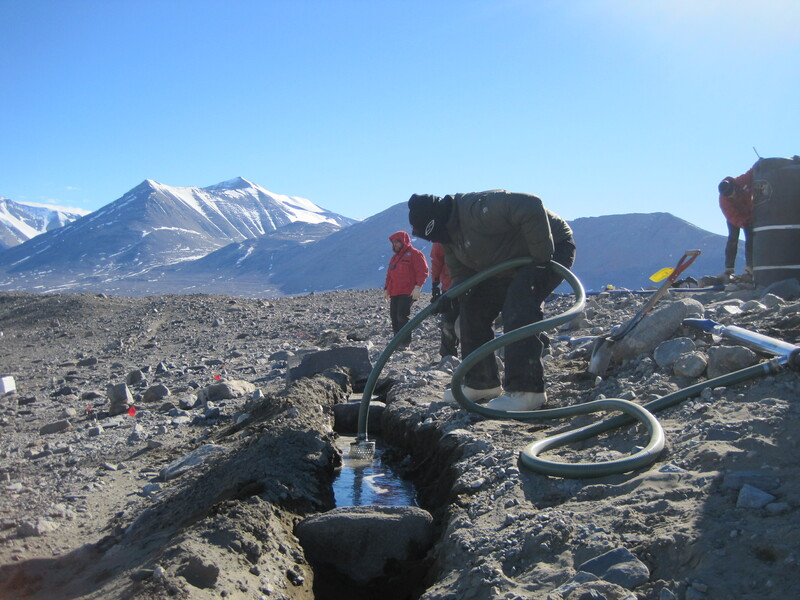 In the Dry Valleys, liquid water is precious. It determines where life can exist and it links glaciers, streams, soils, and lakes. As it flows across the landscape, it brings with it life and nutrients. 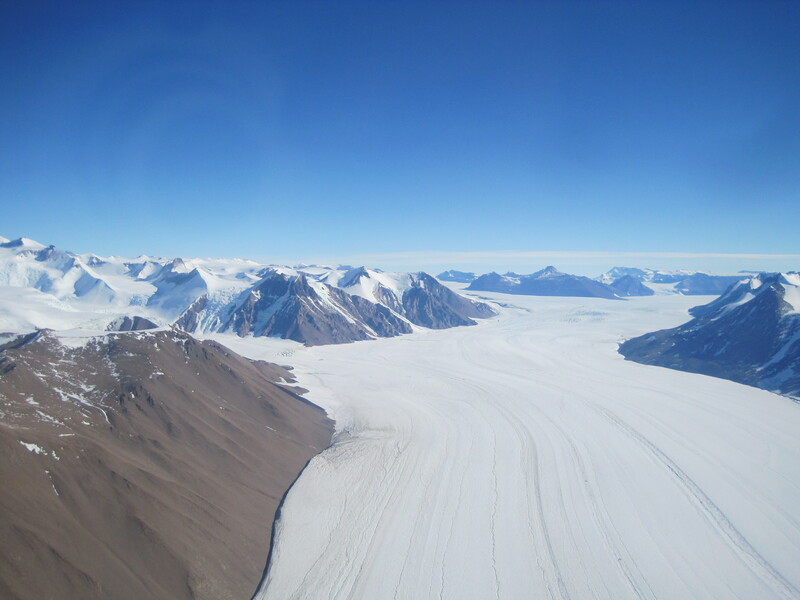 With absolutely no liquid water coming out of the sky (all precipitation here falls as snow), melting ice and snow provide all the liquid water in the valleys. So what happens when it warms? Higher temperatures will lead to more melting, and more melting means more liquid water flowing across the landscape. 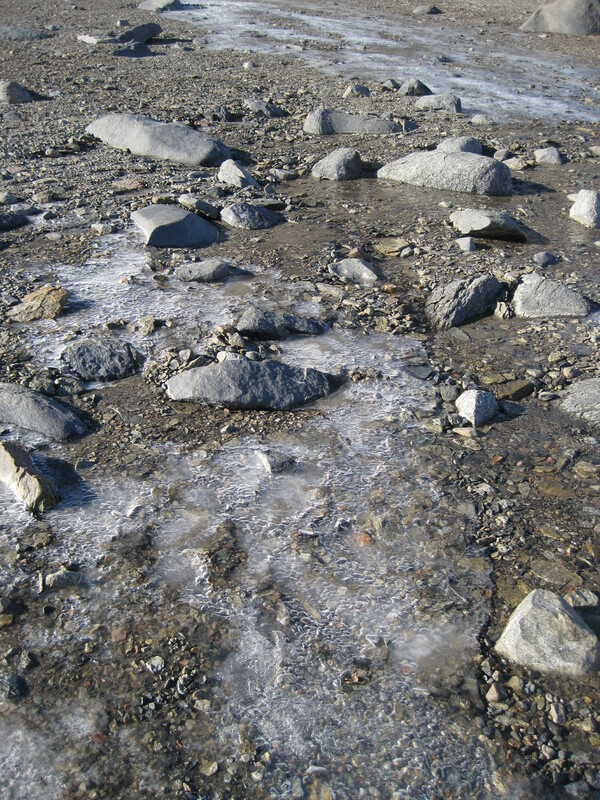 Streams connect glaciers, soils, and lakes, carrying organisms and nutrients. They also make hiking sometimes difficult. It’s easy to visualize glaciers and snow melting, but it’s harder to imagine the melting that will happen out of sight beneath our feet. Permafrost, or permanently frozen soil, hidden only tens of centimeters below the ground, will also respond to a warming climate. In the Arctic, thawing permafrost has already started causing problems – imagine roads and buildings, built on solid frozen ground, suddenly becoming unstable as the ground thaws beneath them. 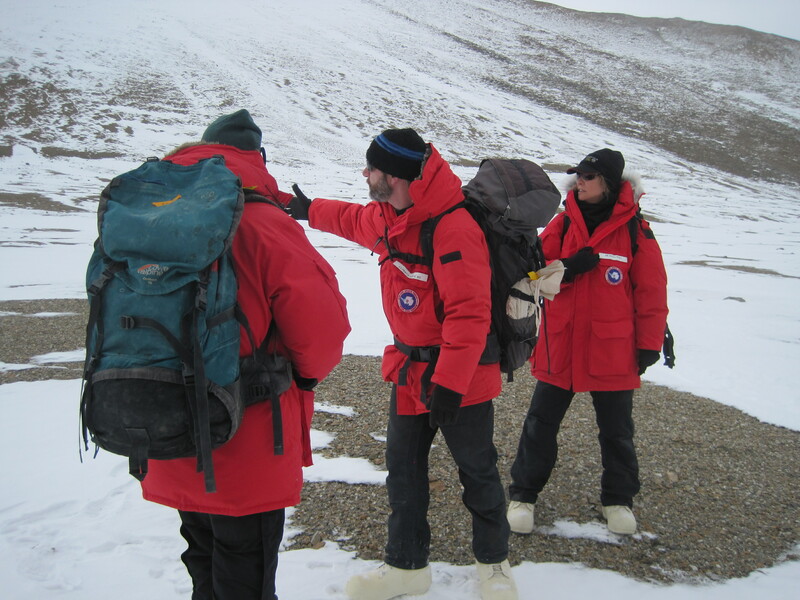 Will something similar happen in the Dry Valleys? 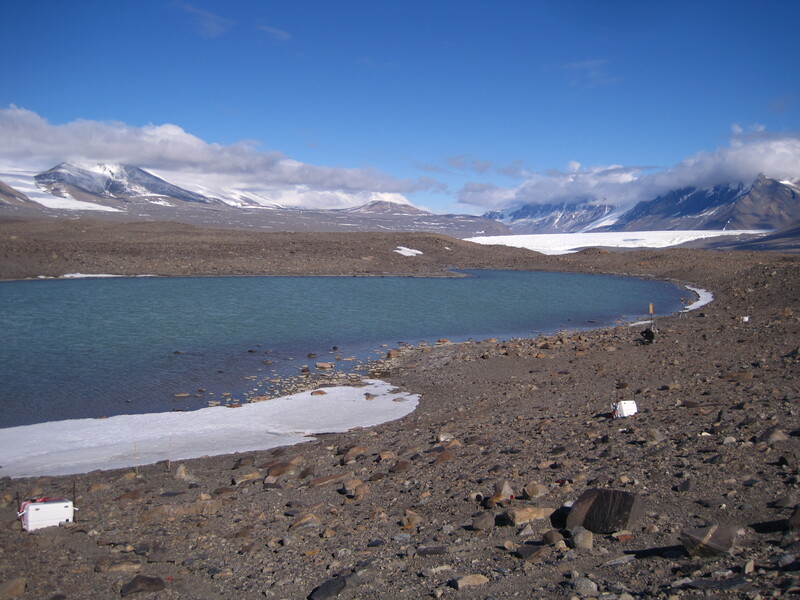 What will permafrost thaw mean for life in the Dry Valleys? How will the additional liquid water change the ecosystem? Glaciers aren’t the only thing that can melt in the Dry Valleys. 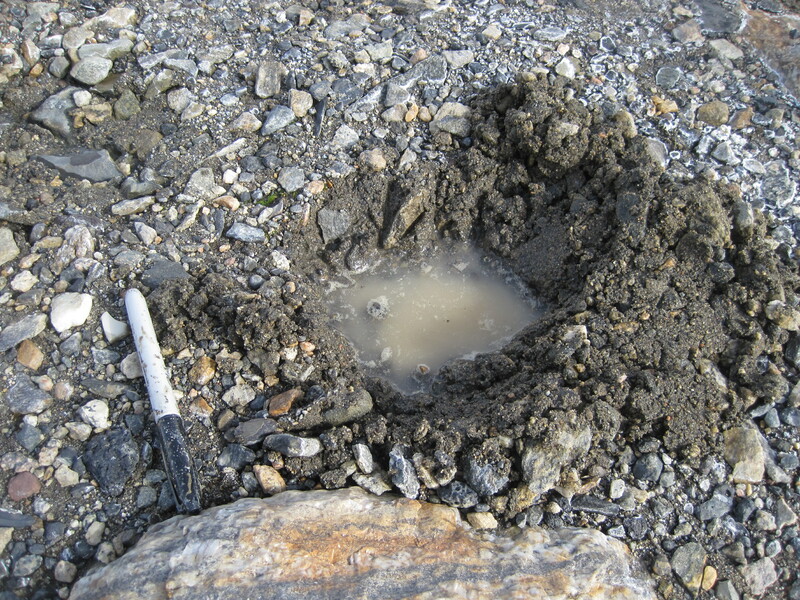 Permafrost, permanently frozen soil, can melt too! That’s what the lead scientists were wondering when they designed the Pulse Press Project, meant to simulate permafrost melt along a hill slope. The basic idea behind the project is to add liquid water at the top of the hill, and to watch what happens as the water flows downhill. 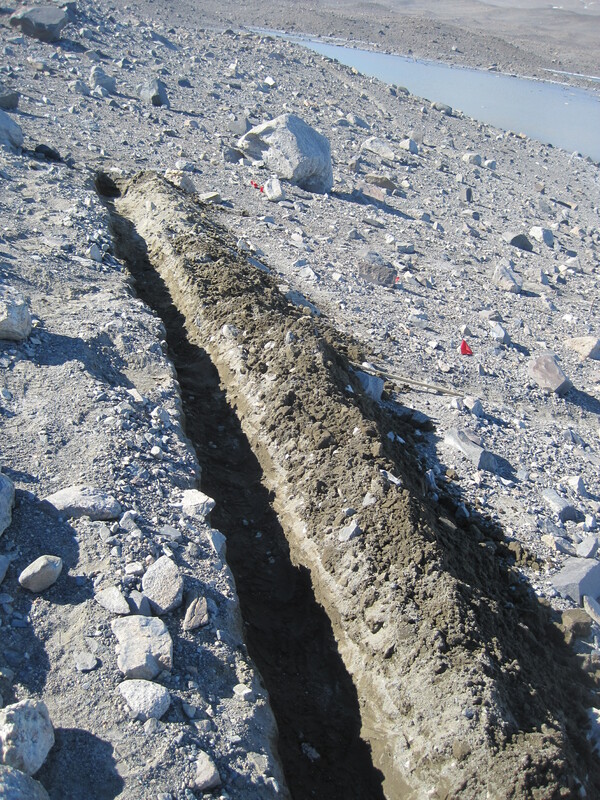 Because permafrost melt happens below the ground surface, the liquid water gets added to trenches so that the water flows through the soil rather than over the soil. The project is a long-term study, meaning that water will get added over the course of many years. Each year, the team will collect soil samples to see how the chemistry, soil moisture, and nematode abundance change as we add more liquid water. The water is added to trenches so that it flows beneath the surface. All of this sounds good in theory, but how do you actually do this in the field? Well, you need a huge tank, a water pump, some tubes, and a huge amount of patience. The hill slope is conveniently located near a pond, so the first step is to pump that water uphill into a holding tank. The water then gets slowly released into trenches, and then we wait for the water to seep down the slope. Water gets pumped into a large holding tank and then slowly released into the trenches. And wait. And wait some more. Apparently it takes a long time for water to flow downhill through the soil. Waiting for the water to drain from the trenches. Big Science requires a lot of patience. Although it felt like it was taking a long time, by the end of two days, all the water has been successfully applied! Now we wait until next year, when we’ll collect more soil samples and apply more water. So, what do you think will happen to the hill slope? Will the abundance of nematodes change? Will the chemistry of the soil change? Will the hill change visibly, or will all the changes be hidden from the naked eye? Even the lead scientists don’t know the answers to these questions. And that’s what makes field research so exciting. We can make as many educated guesses as we like, but we can always be surprised by what actually happens.